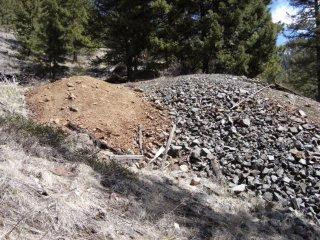 There are few experienced placer gold miners who are adamant believers in re-working old placer mining tailing piles. After all, what's done is done and you can't squeeze blood out of a turnip. Or can you? Here's the hot poop about tailings. Coarse Tailings: These represent the gold-bearing material that has been screened or sized (or "classified") before being fed into a piece of mining equipment. For example, the coarse tailings in a one-person dry washer operation represent the gold-bearing material shoveled onto the inclined screening hopper of the machine. 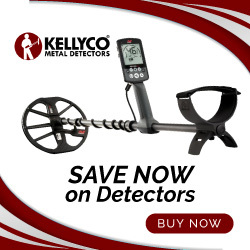 Anything smaller than 1/2 to 1/4 inch in diameter passes through the classifying screen while anything larger falls off and away forming a coarse tailing pile of rocks and gravel. Fine Tailings: These are what's left over after the gold-bearing material has been processed through a piece of mining equipment. Again, to use the example of a one-person dry washer operation, fine tailings represent the smaller, lighter material that is "puffed" down the riffle tray and out onto the ground below the bottom end of the dry washer. The same holds true for any piece of mining equipment. Those are the basics of tailings. Again, they represent waste materials resulting from mining operations. Now here's the question of the day: are tailings worth sampling or working? The answer to that is yes on the first count and maybe on the second. I don't care how good a miner is or what gear he or she is using...some gold is going to escape their clutches. The issue is how much gold. If you're talking about the fine tailings coming out the end of a sluice or riffle tray not very much probably. Now I just made that statement and I have to follow it up with the fact that the very first placer nugget I ever found I retrieved from a fine tailings pile along a small creek on my aunt's property outside Nevada City, California when I was still green around the gills in this small-scale gold mining thing. That nugget wasn't very big, but by God it was a nugget just the same. I was deliriously happy with that find and jumping for joy at the time. Your first nugget is always a special event and should be celebrated. Of, course, I went crazy after that and ran the entire fine tailings pile through my portable sluice box. The end result? Nada, except for that little nugget. There's a lesson here brothers and sisters. It doesn't hurt to sample a fine tailings pile once in a while but using fine tailings as source material to feed through your equipment is probably only going to get you into good shape physically and not much else. On the other hand coarse tailings can be quite good at times. Of course lots of variables come into play here, like how good the miner producing those coarser tailings is, whether the over-sized material has clay or caliche on its surface, and so on. 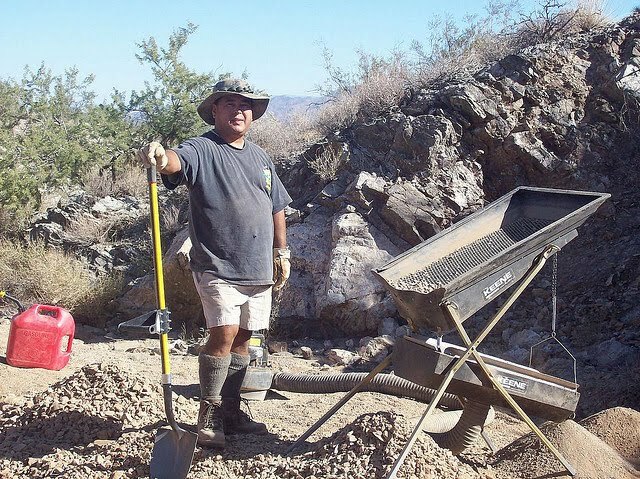 Any desert rat or mountain stream placer miner worth his or her salt will take over-sized material like that and clean or "puddle" it in a five-gallon bucket or wash tub to remove the clay or caliche and then sample or run it to see how much gold may be entrapped in it and then take things from there. Many small-scale miners working the deserts and wet placers fail to do this. Hell, even some old timers ignored this step because they were working good ground and were hell-bent on moving lots of dirt. Now I'm not saying you need to clean every bit of gravel that slides off your grizzly or hopper screen but you damn well better take a look at those larger rocks that do. If they have dirt, caliche, or clay stuck to them and you ignore them, you may very well be throwing gold away. The other important factor to note about coarse tailings is that larger pieces of gold like bigger nuggets or gold in matrix rock or quartz will end up buried in or under those coarse tailings as you shovel away like a madman trying to move as much dirt as possible. Here's a tip for you. ALWAYS sample your tailings (fine and coarse) periodically to see if you're losing or missing anything. I've told this story before methinks, but in the early 1980s my mining pard and I were using my motorized wooden puffer and working a dry placer claim just outside Yuma, Arizona. We'd been there alone for days, doing the pick and shovel thing on a gold-bearing bench in a small dry wash. In truth we'd gotten meager returns for our efforts and were hot, tired, and frustrated. I'd only been at this small-scale mining thing for about three years at that point but still thought I was the cat's meow when it came to all things mining. Rampant ego, you see? Adjoining the claim was an area that was open or unclaimed...I can't remember which. Anyhoo, some dude rolls up the bumpy desert road and starts setting up a Keene dry washer that was the old lanyard pull type. In other words, to operate the bellows underneath the riffle tray you yanked a lanyard and each time you did the bellows pumped up and down. Talk about labor intensive! So we decided to take a break and had a hell of a good time watching this dude who was obviously greener than green take a swing at a coarse tailings pile from the old days. For the rest of the afternoon he would toss a shovelful of those coarse tailings onto the hopper screen of that Keene and then get to yanking furiously at that lanyard. It was a hoot to watch! Reminded me of the cannon cockers in Vietnam firing artillery. Each time the dude yanked the lanyard my pard would yell "Outgoing!" and we'd double over. We made great fun of this guy and his antics, laughing until we had tears in our eyes and were clutching our convulsing stomachs. Well, we finally settled down and walked over to this dude, being the "neighborly" sort we were. I had to bite my tongue to keep from grinning as I asked him how he was doing. He replied "OK, I guess." He produced a vial of gold from his pocket and I about fell over! 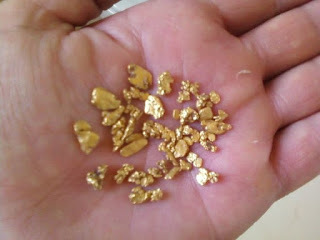 It was nearly half full of coarse gold with a couple of nice, small nuggets included. Much chastened, my pard and I slunk back to our digs. There's a couple of lessons to be garnered from this story and one of them is that older, coarser tailings piles can be slam dunks at times.